Based in the beautiful city of Exeter, Bridge has grown from humble beginnings to become the South West’s largest multi-franchise motorcycle dealership and riding destination. Being a family owned company means that we know the value of sticking together, treating customers as one of our own and, Stuart, Lee and Dan Anthony are each committed to providing the very best customer service and quality of care to everybody we deal with. After all, isn’t biking about the community of riders who look out for each other? As an award-winning dealership, you can be certain that you’ll always be in capable hands thanks to a team with a wealth of experience that spreads throughout our showroom taking care of you, and some of the most celebrated mechanics in Europe looking after your pride and joy. We’re a destination dealership and always have over 200 used and pre-registered machines at any one time around our Exeter showroom, meaning that we’ll always have something to suit any taste or budget. And, with competitive finance available too, your dream machine could be more affordable than you ever imagined. For added peace of mind too, we also offer an additional product in the Adelphi guarantee and breakdown assistance, to protect you outside of the standard three-month warranty, should the worst happen. 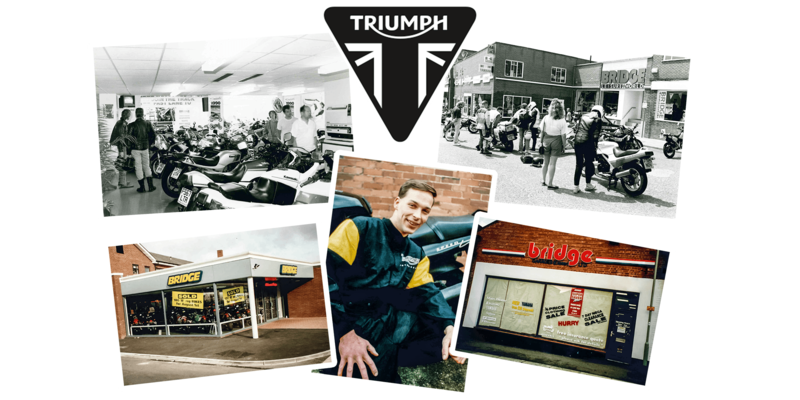 Here at Bridge, we’re proud to be the longest-serving Triumph motorcycle dealership – anywhere in the world! We’ve been selling motorcycles made by the iconic brand since they re-entered production in the early nineties and have enjoyed a fantastic relationship with the British marque ever since. You can be sure that when you purchase a new or used Triumph from us, you’re buying from the very best. From our factory-trained technicians, to our long-standing Triumph sales team, you can be sure of the quality and care of the service that we provide here at Bridge. We believe in all our customers and wanted to give something back as a way of saying thank you – with this card, there’s no limit to how much you can save! We’re pleased to offer our Lifetime Warranty on all new motorcycles, giving you complete peace of mind and protecting your investment for years to come. Our drivers are greatly experienced in couriering motorcyclesand will deliver your machine with the attention and care it deserves. Buying used doesn’t need to be a worry thanks to our additional extended warranty that’s available, with extra benefit from breakdown assistance and recovery. No destination dealership would be complete without an excellent on-site café. Serving hot and cold food and open 7 days a week! We’re able to offer both Personal Contract Purchase and Hire Purchase financing (subject to status), helping the dream-machine become a reality. Here at Bridge, we pride ourselves on the standard and precision of our work. With our award-winning, factory-trained technicians being among the best in Europe, you can be safe in the knowledge that your machine is in the most capable hands. We are fully accredited by; Triumph, Honda, Kawasaki, Yamaha, Suzuki, Vespa and Piaggio and are supplemented by our excellent Parts department, which only works with manufacturer-approved parts and suppliers meaning you can be sure of only the best quality from us. Honda’s CBR650R – a motorcycle for every day of the week? Kawasaki’s Versys 1000 SE – the new touring king? Is Yamaha’s Tracer 900GT the ultimate jack of all trades?